Thanks for your interest in reserving a space at Henry Summer. Please complete the form below and a member of our team will be in touch within 48 hours to confirm availability. 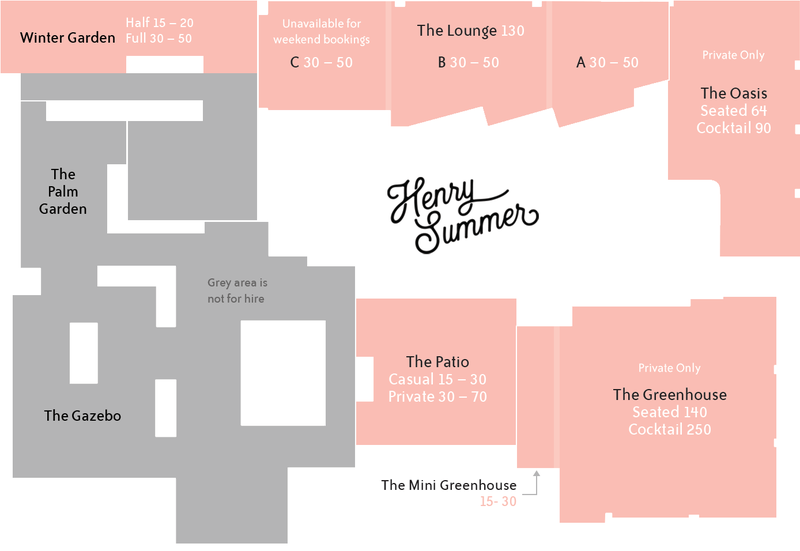 Please note that Henry Summer is a walk-in venue for groups smaller than 15. This will help us tailor a package for you. A private area is a room or space exclusively set aside for your big event. Whether it be an engagement, wedding, birthday, or Christmas function, our private spaces do not disappoint! Available for groups of 50 – 900 guests. Available for cocktail and sit-down functions. Lighting, temperature, furniture and music can be tailored to suit your event. Minimum spends apply. A quote will be provided to you by our team following your enquiry. A casual area is a reserved section within our venue which has been set aside just for you! Perfect for relaxed birthday drinks, cocktails with your work colleagues, or some cheeky evening nibbles. Available for groups of 15 – 80 guests. Areas subject to availability and capacity. Variations to lighting, temperature, furniture and music are not negotiable for casual hire as these rooms are shared with other patrons. Exclusive bar use not available. Casual area minimum spends – minimum spend for casual areas is determined by your group size. This amount will become your food and bar tab on the day. Please note that a minimum spend applies to all reservations. 80+ groups must hire an exclusive room. For groups of 80 or more we have a selection of spaces available for exclusive hire. Numbers indicate the capacity of each area. Please note that some areas can be sectioned into smaller areas. Your credit card will not be charged until the functions team have confirmed your booking. Full payment is required to confirm your reservation, as is acceptance to our terms & conditions. Please note that your booking will not be confirmed until the required deposit is taken. Cancellations: deposit payments are non-refundable. Once confirmed, changes to time or dates for functions and bookings must be submitted in writing 10 days prior to your booking. Changes are subject to availability. Changes to time and/or date are not permitted after this time and are subject to our cancellation policy. The booking will be held for no longer than 30 minutes, after this time the area will be made available to the public. We're also fully licenced, so no BYO. No external food or beverages to be brought into the venue. There will be no exceptions for responsible service of alcohol. Juveniles must be accompanied by a responsible parent or guardian at all times. At all times, the sale or supply of liquor to a juvenile is strictly forbidden under any circumstance. Your reservation, final numbers, and package of choice must be confirmed via email to functions@henrysummer.com.au 10 days prior to your booking. Please make us aware of any dietary requirements in advance. We are unable to take responsibility for any guest who do not advise on food allergies or dietary requirements prior to the date booked. Please be advised that we do not have the facilities to store any items within the venue. All items brought must be taken away after the conclusion of the event. Please note that Henry Summer is a dog friendly venue. For the enjoyment of other patrons, we ask that dogs are kept on a lead. We'll be in touch within 48 hours.